A lot has been said about gamification, dubbed badgification by some, and it seems people are still divided over whether it’s a fad or the future. Be that as it may, one area where I think it just might work is health and fitness improvement. Enter Foodzy, a service that enables users to keep track of what and how much they eat over time, in order to provide them with some insights on how to eat and live healthier, lose weight or simply on how their eating habits compare to their friends. Today, the fledgling Amsterdam company behind the service (not to be confused with Foodzie by the way) is launching free applications for iOS and Android, although one needs a Foodzy Pro account ($15 per year) to log in. The app helps people keep track of what they eat even when they’re on the move. 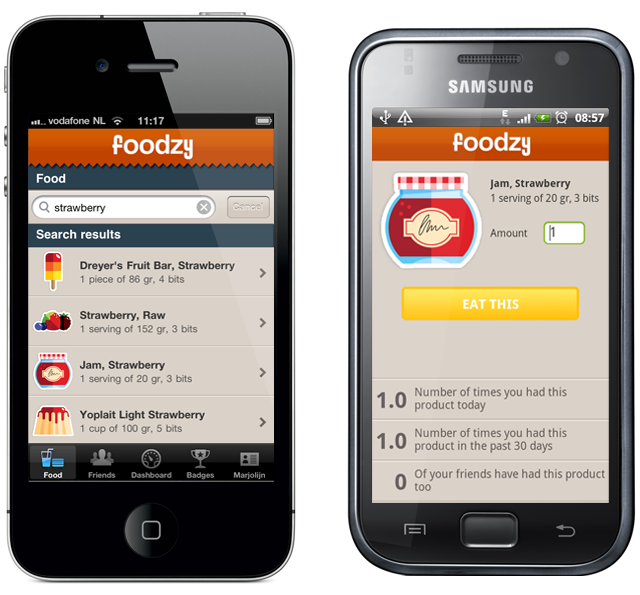 Using Foodzy, one can access deep statistics and unlock badges (there we are!) for healthy eating habits, but also for fun ones – think Hangover badges for when you’ve consumed too much alcohol in a single night, or a BBQ badge for barbecuing more than 5 times in one Summer. Foodzy uses localized food databases from over 58 countries, and is currently available in English, French, German and Dutch. You can check out Foodzy free of charge, but the number of badges you can earn are limited and your eating history will not be kept longer than 30 days. Also, as I mentioned before, you need to cough up cash for the premium version of the service and to be able to use the mobile applications. Foodzy was one of the 18 finalists at this year’s TNW Conference Startup Rally, where it was ‘soft-launched’ – they opened up for public beta about two months ago.